Get Home with Uber! Tired after a long day at work? No worries, we'll get you home. 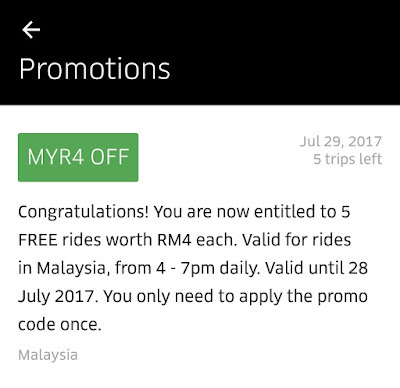 Just apply the Uber promo code Malaysia: GETHOMEWITHUBER to get 5 FREE rides worth RM4 each, valid from 4PM - 8PM this week! Congratulations! You are now entitled to 5 FREE rides worth RM4 each. Valid for rides in Malaysia, from 4 - 7PM daily. Valid until 28 July 2017. You only need to apply the Uber promo code once.